The Frama company of Switzerland produced a special type of patterned paper suitable for dispensing by machine and electronic printing that could be used to create an unlimited number of different stamp designs. The British Post Office used the paper experimentally in vending machines in 1984-85 but the experiment was not regarded as a success. 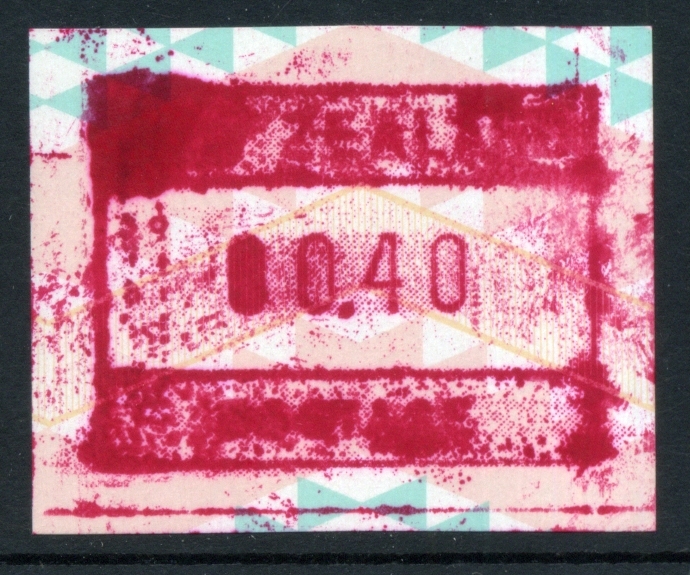 Frama labels were also introduced in Switzerland in 1976. Frama labels were distinctive for the whole design being printed in one operation onto the special paper, including the value, rather than just the value being printed onto a pre-printed stamp. 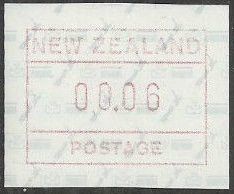 New Zealand trialled these labels in 1984 and continued to use them through until the mid - late 1990s. It would seem that like was discovered in Great Britain, this system of per-paid postage was not completely successful. 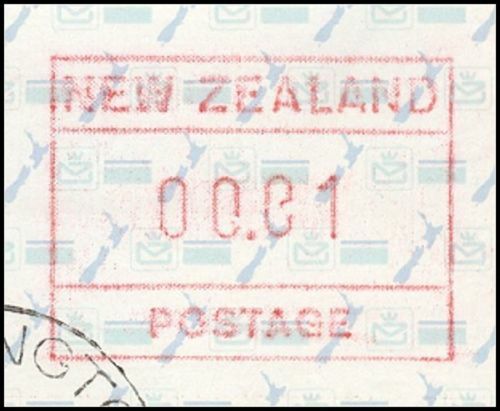 This post will follow the story of New Zealand Frama Stamps from their trial in 1984 through to their last issue in 1996. Along the way we will also look at First Day Covers and flaws where the vending machine misprinted. When Allan suggested I do a post on these, my first thought was "Boring!" Then I looked at them and became fascinated of them. Soon I was telling things of Frama Stamps even our stamp experts didn't know. Ha! Ha! 1984 New Zealand Trial Frama Stamps. The first New Zealand Frama appeared in 1984 as a limited trial. They can be identified by the four stars of the Southern Cross and their blank background. 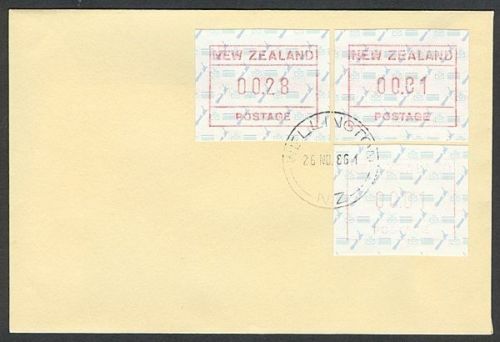 First Day Cover - 3 September 1984 with 24c 30c 35c labels. I thought these were the only three values until we found the 40c value on the errors below. 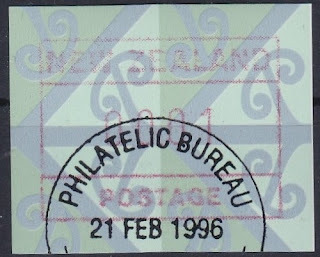 As many different values could be produced by these machines the stamps on this post must be considered as examples rather than complete sets. 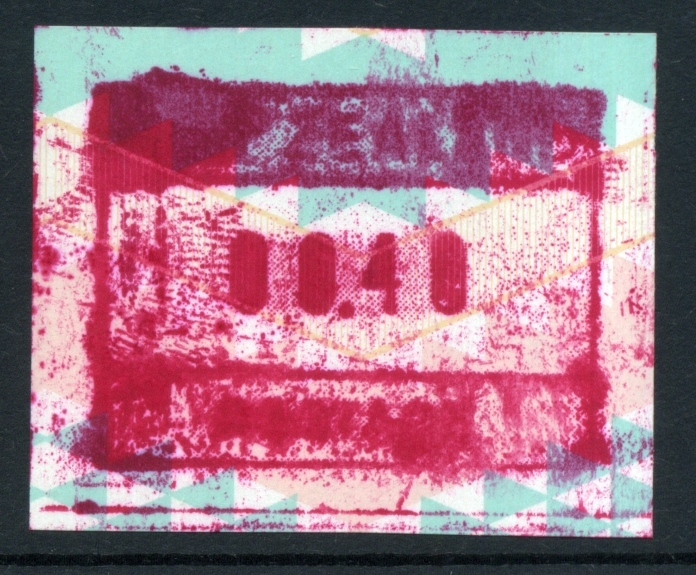 1984 Frama Trial Label Errors omitted top frame of 3 different values. It could be that a collector discovered the machine wasn't set correctly making this error so he decided to run a few extra copies off of various values. These could also be wastage as the machine was being adjusted by a technician. 1986 New Zealand Map Frama Stamps. 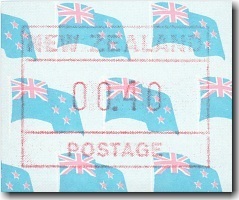 The second issue of Frama Stamps appeared in 1986. They are often referred to as a Map Frama due to the tiny map of New Zealand which appears, almost like a watermark, in the background of each stamp. Both of these covers claim to be First Day Covers with the top one even being signed by a Post Master. 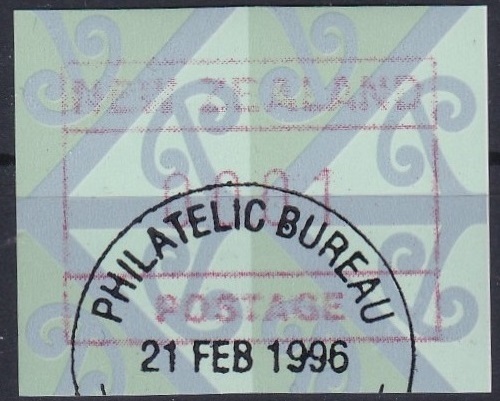 The Stamps New Zealand Ltd catalogue states that the official First Day of Issue was 12 February 1986. The cover above is dated the 27th March while the one below is the 1st May. I can think of no reason for this other than FDCs may have been released for each Post Office as their machines came on line. 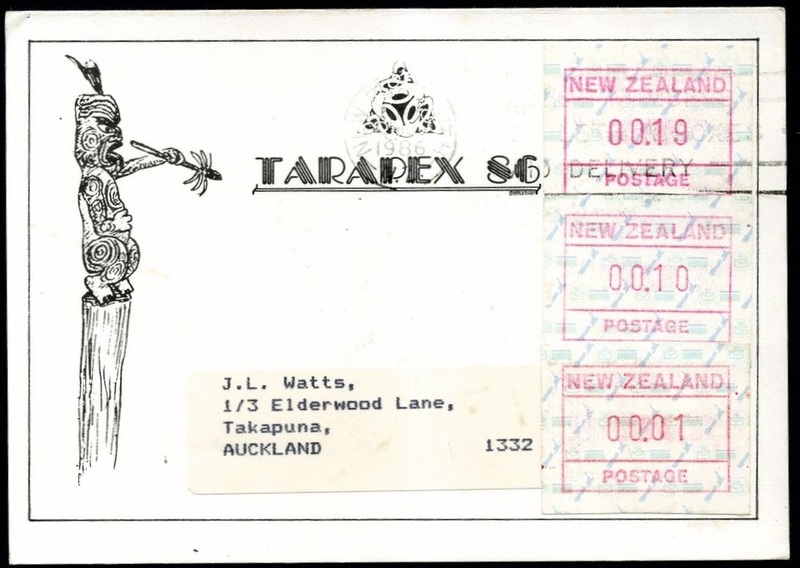 The Tarapex '86 National Stamp Exhibition was held in New Plymouth between 17-27 October 1986. 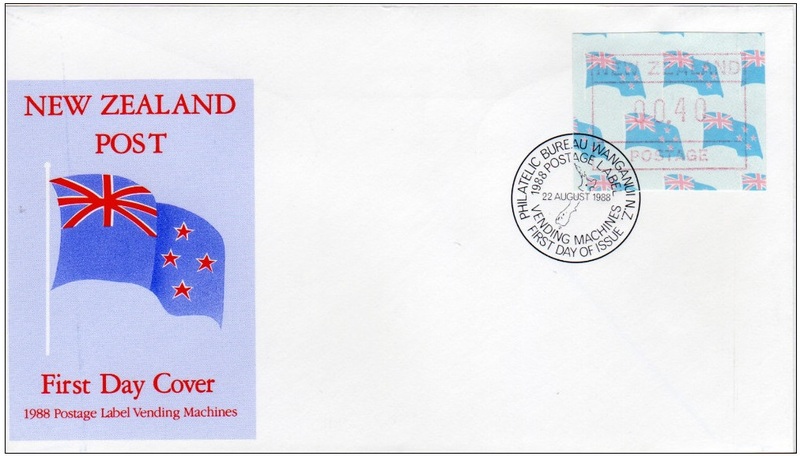 This cover shows three 1986 Map Frama stamps used on an exhibition cover. 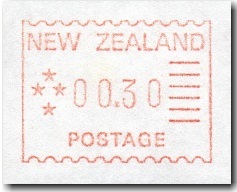 The three stamps add up to a value of 30c which was the current postage rate for an ordinary domestic cover at that time. 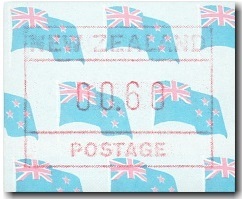 A Sets of 1986 Frama Stamps. All most any value could be produced by the Frama vending machines as can be seen by these two sets below but normally you would only find values that were commonly used for postage. Any others would most likely be made especially for collectors. The first set below shows every value from 1 cent to 24 cents. Frama Map Stamps - Values 5c - 8c. Frama Map Stamps - Values 9c - 12c. Frama Map Stamps - Values 13c - 16c. Frama Map Stamps - Values 17c - 20c. 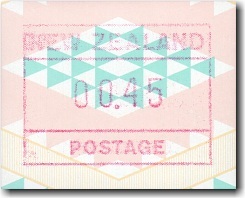 Frama Map Stamps - Values 21c - 24c. 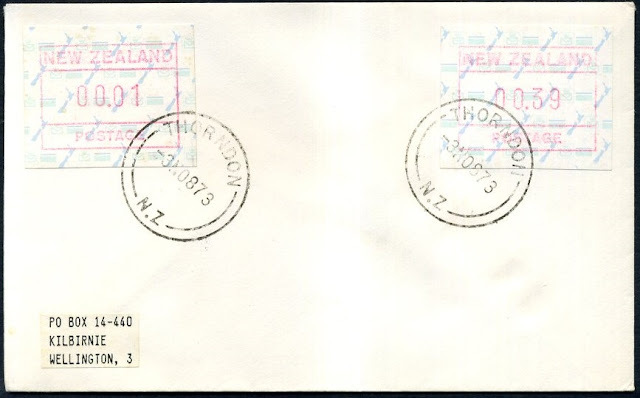 The three covers below show a similar set but now they have been placed on covers and are cancelled with the 12th February cancel from the town of Masterton. 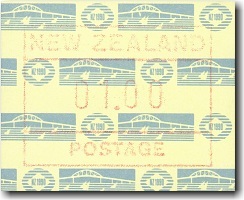 Notice the special First Day of Issue cancel used on these covers. 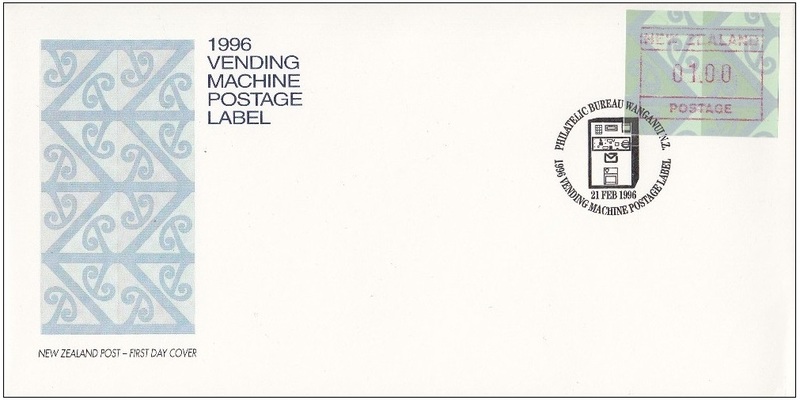 It says "First Day of Issue - Induction of Postage Label Vending Machines." Frama Map Stamps on Cover - Values 10c - 19c. 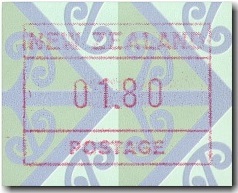 Frama Map Stamps on Cover - Values 20c - 25c. 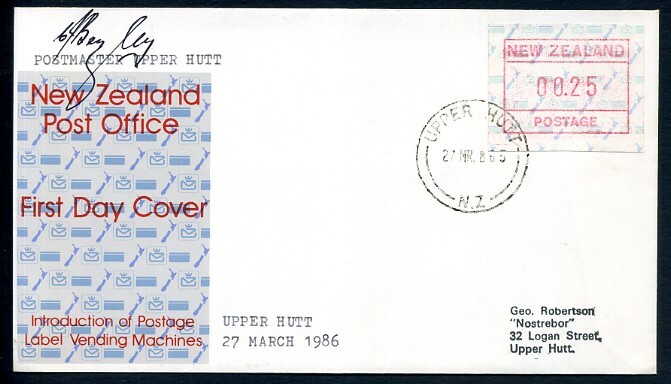 Not sure why this cover has 1c and 39c to make the required 40c postage. Two different examples without a value. I would not have thought that was possible but here it is. 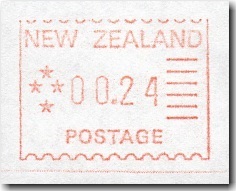 Above is a cover showing a flaw on the 1c stamp. When we look at a closer view below we can see both the "0" before and after the decimal point are damaged. 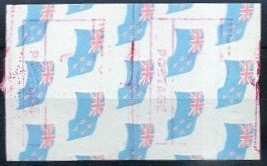 1988 New Zealand Flag Frama Stamps. 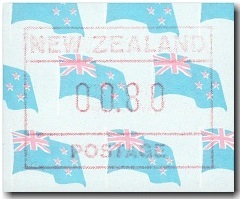 The next Frama issue was the Flag Stamps which appeared 22nd August, 1988. Below is a small selection of five values. 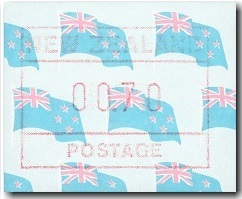 Frama Flag Issue First Day Cover - 22 August 1988. Flag Frama with too much ink causing blocking and smudging. Flag Frama light partly printed image. 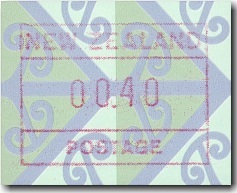 1990 New Zealand Exhibition Frama Stamp. 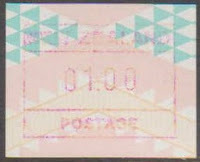 The next Frama Stamp was the Exhibition Frama which was issued on 24th August, 1990. 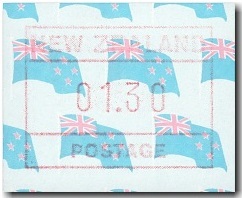 The top on is an official NZ Post FDC while the one below is a post card sent overseas. Notice that the post marks are different too. The top cover carries the FDC post mark while the lower cover carries an official post mark used for the while exhibition. But are dated 24th August which was the opening day of the exhibition and first day this stamp was used. 1990 New Zealand Airplane Frama Stamps. 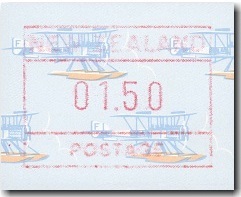 A few weeks later on 12 September, 1990 the Airplane Frama was issued. 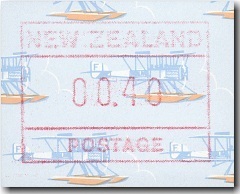 Frama Airplane Issue First Day Cover - 12 September 1990. By far the best Frama First Day Cover. 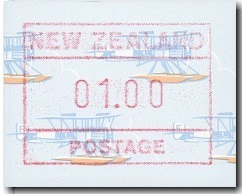 The aircraft, a Boeing Model 1 (B & W Seaplane), used for the stamp background and this cover is the one used for New Zealand's first airmail flight. 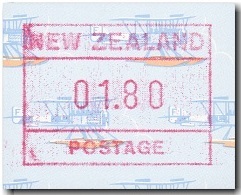 On the 16th December, 1919: George Bolt made the first experimental airmail flight when he flew from Auckland to Dargaville and back again on the same day, a total distance of approximately 320 kilometres (200 mi). A strip of four more Aeroplane Frama. 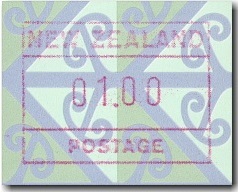 1992 New Zealand Maori Weaving Frama Stamps. The next Frama is known as the Maori Weaving Frama. It first appeared in First Day Cover - 12 August 1992. 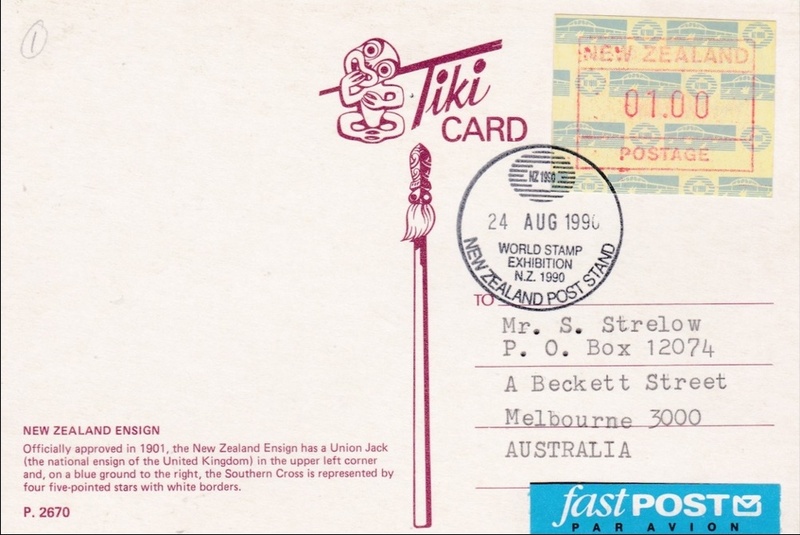 Frama Maori Weaving Issue First Day Cover - 12 August 1992. 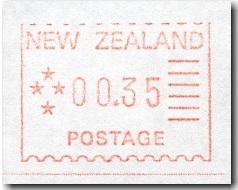 There was another First Day Cover on 2nd October 1995 when a decrease in postage let to the 45c value being dropped for the 40c value. Two of these can be seen among the errors below. Now here is a big mess. The over supply of ink has made these labels almost unreadable. 1996 New Zealand Maori Rafter Frama Stamps. 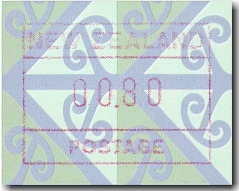 The Maori theme continued into the final issue of Frama Stamps in New Zealand, in 1996. It seems like soon after this the Frama machines were removed from most Post Offices and the Frama Story had come to an end. The design is a kowhiawhia (Moari rafter design) See our post 2015 Matariki - Kowhaiwhai. Frama Maori Rafter First Day Cover - 21 February 1996. Maori Rafter Frama - First Day of Issue. Oh boring! I like that. You did a good job for such a boring subject. Yes I agree. There is always something interesting to find in this blog. I knew nothing about Frama Stamps. If i've seen any I've never noticed. Now I can see there is a story, a history to these stamps. That fact that you even found flaws in these labels is rather amazing. I suppose the machines stuff up from time to time but I would expect that the damaged stamps would have been just binned. It was smart of someone to save a few. Yes I agree. A nothing set of stamps has turned into an interesting story. I found this page among your list of special posts. At first I wondered why you've selected such stamps as being special. But then I began reading and following Asami through an interesting story / history. Yes it was a good choice for your top posts page. 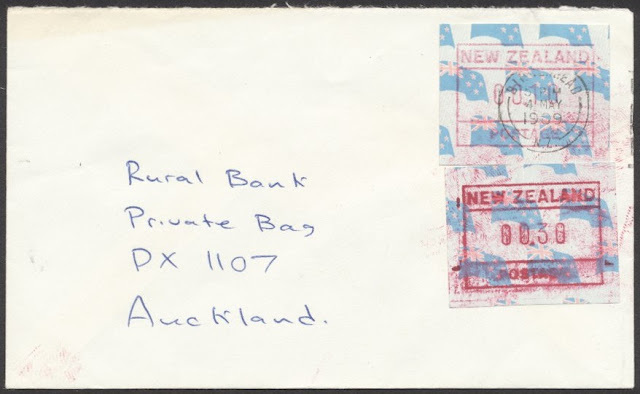 I've been collecting Frama Stamps from NZ for a couple of years. But it is very difficult to get nice pices (First Day Covers, Letters, etc.) here in Germany. So it is very interesting for me to read your article and gives me much help. 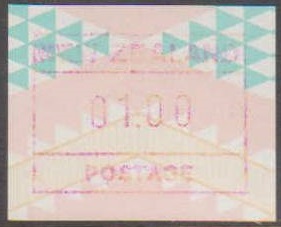 Special the errors on the First Day Cover from 2nd October 1995 with the 40ct value. I did not know this error yet. Maybe I find a way to get such a stamp. I think these two sites would give you the best selection of NZ Frama stamps. In the early issues of Frama Stamps it was hard to define an exact First Day of Issue as different post offices issued stamps as their Frama machines came online. 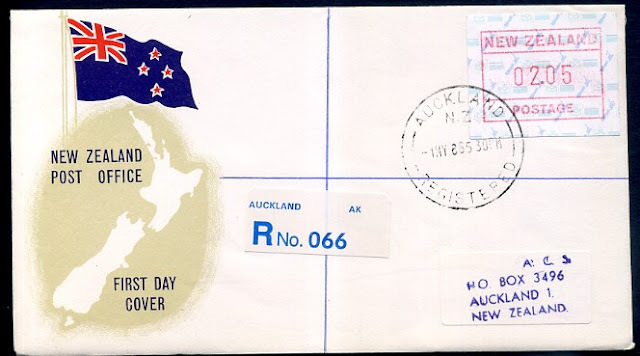 Of course with later issues, FDC dates were much more clearly defined. 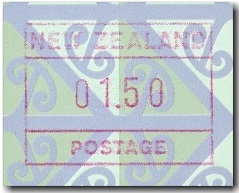 Examples of those 1995 errors can still be found for sale on the completestamp.co.nz web site. Thank you for your quick reply. The reference to the website is great!! There is a lot to be found for my collection ;-). Finally, a question. In the German Michel-catalog, there are two overprint colors are listed ex 1986 Frama stamps? Is that right? We do not know of any other colours than the reddish/pink shown on this page. We would be interested in more details on this if you have them. Maybe a image too. While we try to reply quickly to comments and questions sometimes we are busy of they get missed.